First go to the Finale website: https://www.finalemusic.com/. Click on "products" on the top menu and select "Notepad". 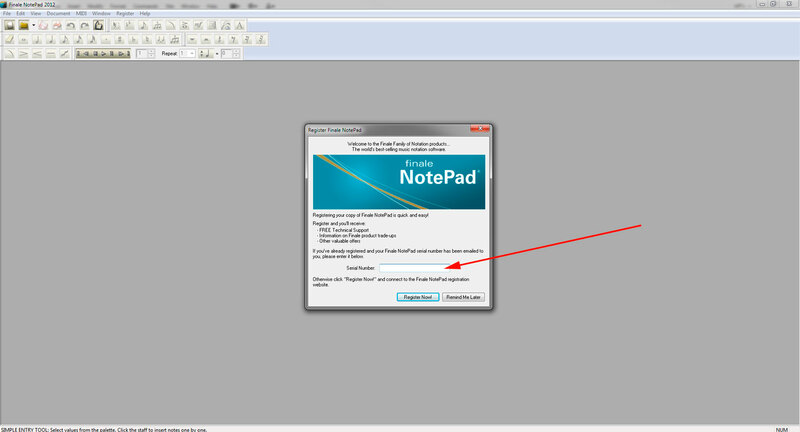 A new page will load in your browser regarding Finale Noptepad. Click on "free download". On the next screen you will have to create an account (or log in to an existing one). Don't worry about offering up your email address and getting spammed in return. I've been using Finale software for decades and they're a reputable company. 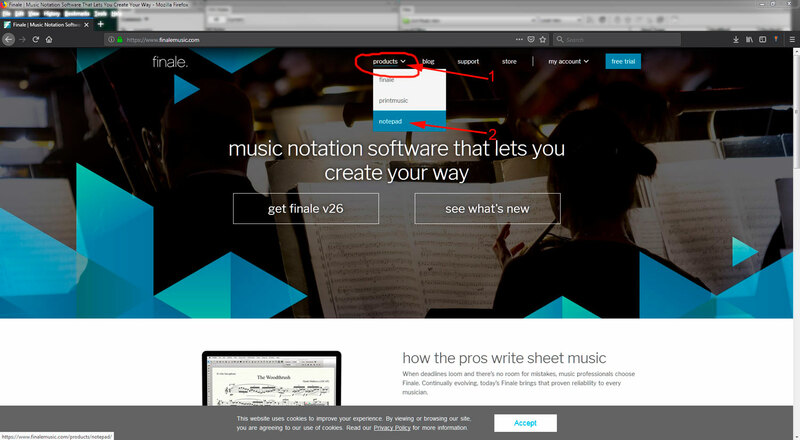 Once you've created your account (or have an existing one), go to www.finalemusic.com. Click on "products" on the top menu and select "Notepad". A new window will load. Click on "free download"). If you're logged in skip this step and go to the next one. If you haven't logged in yet you will need to do so. 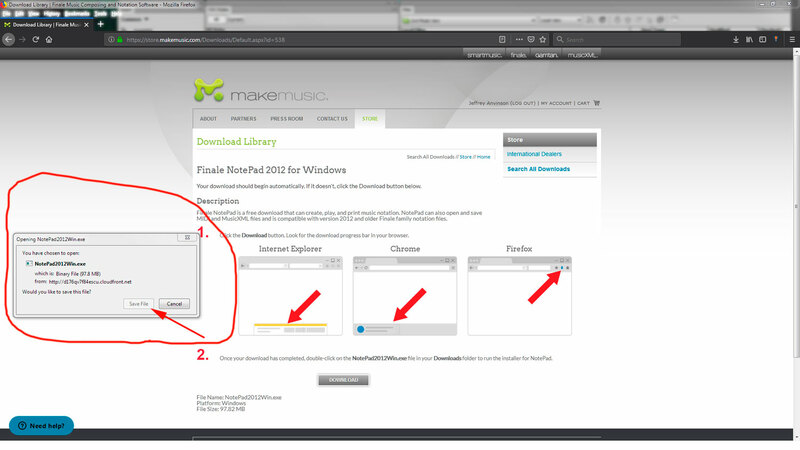 A new page will load where you can download the installation software. Click on "Save File" and remember where you are saving it on your computer. Find the installation file on your computer and install it. When the installation is finished, run the software from the windows menu. The first time you use the software it will ask you to register it and get a serial number, or you can choose to be reminded later. 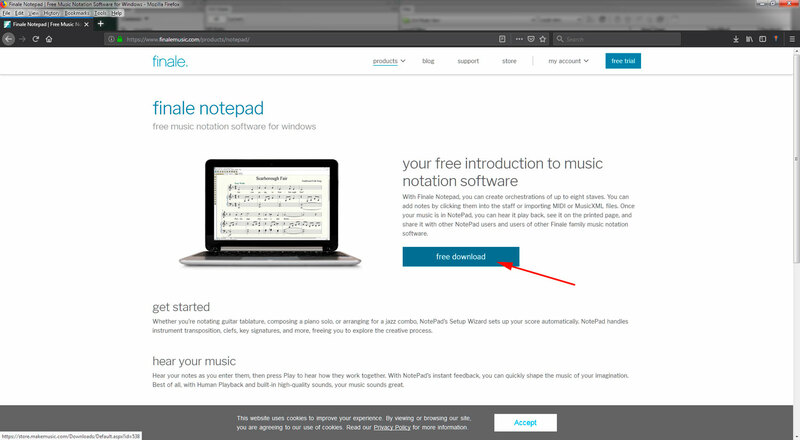 I'm guessing that you'll find Finale NotePad fairly easy to use. It's a very watered-down version of the full flagship Finale product, but it's a great place to start. If you like its features and want to upgrade to get more, there are various options and price ranges available to you. If you're a student or teacher, you may be eligible for an educational discount. One feature of NotePad that may not be obvious is cleverly hidden in the bottom left-hand corner - the layer feature. The small numbers - 1, 2, 3, and 4 - can be clicked on to notate four different layers of music in each measure. (The notes usually appear in four different colors so you can tell them apart.) The notes in each layer must add up to the number of beats in the measure. Use layers to notate parts that are independent in some way, like the melody and bass lines. The layer feature is especially helpful in contrapuntal textures (several melodies occurring at the same time). Of course, there are many features in the software, but this one can be easily missed - hidden as it is on the bottom of the page. If you have any questions please send me an email at jla@jlamusic.com. I've been using Finale for decades and use it every day to compose, arrange, record, teach, notate, transcribe, create tests, import and export midi files, create pedagogical materials, export graphics, and more. It's a powerful tool that can benefit any musician.